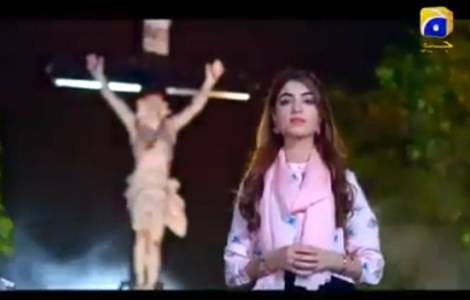 Faisalabad (Agenzia Fides) - "The promo launched by the famous broadcaster Geo TV uses symbols of Catholic faith like the crucifix and the holy rosary, and in the second scene openly hurts the sentiments of the Christian community in Pakistan": is what Fr. Qaisar Feroz OFM Cap, Executive Secretary of the Episcopal Commission for Social Communications tells Agenzia Fides, expressing the disappointment of the Catholic community in Pakistan for the new series of TV episodes entitled "Maria daughter of Abdullah", which will be broadcast on one of the most viewed channels in Pakistan, Geo Tv. "The promo of the series not only profanes religious symbols, but insults Christianity as a religion and also Christians. The initiative hurts us". The priest notes with disappointment: "This series will be harmful especially for young Muslims and Christians, it will destroy unity, peace and harmony among young people of various religions and will generate quarrels and divisions". Christians in Pakistan are already shocked by the trailer of the new serial. The promo shows the Cathedral of the Sacred Heart in Lahore and then a girl standing in front of the Crucifix that says her name, Mary, holding a rosary. Later the same girl is portrayed in front of a mosque while she recites Islamic prayers and reads the Koran. The story seems to narrate the conversion or the Islamic marriage of a Christian girl, a sensitive issue in Pakistan, where there are numerous cases of forced marriages. "The Constitution of Pakistan guarantees that all citizens in Pakistan are equal before the law and are entitled to equal protection of the law. It is regrettable that equal rights and equal opportunities are not guaranteed to all because of discrimination based on faith", wrote Professor Anjum James Paul, a Catholic, president of the Pakistan Minorities Teachers Association (PMTA) in a letter addressed to the Prime Minister and the President of the Supreme Court of Pakistan. In the letter, Professor Anjum James Paul asks to "stop the desecration of Christianity" in that TV series. Speaking to Fides, Professor Paul states: "It is a shameful act. The publicity of the new series offends the feelings of Pakistani Christians". And he points out: "Christian girls are already at risk, they are often harassed, kidnapped and converted to Islam, or forcibly married to pedophiles". Even some textbooks used in public schools promote hatred against Christians and Hindus. Severe action is needed against the producers of this television serial for having outraged the religious feelings of Christians in Pakistan. Gospel TV Network, Christian broadcaster of Pakistan, through its Facebook page has invited Pakistani Christians to protest on social media as much as possible. Adeel Patras Chaudry, vice president of another Christian TV, Jesus Life TV, has asked to ban this TV series before airing: "We ask the Prime Minister of Pakistan and the Chief of the Army to intervene. Christians are often falsely accused of blasphemy against Islam, but this is blasphemy against other religions.